The Division 2 Dark Hours is the game's first new raid, promising to test endgame players with their biggest challenges yet. So far Ubisoft has only shown snippets of what to expect from Dark Hours, but an alleged Reddit datamine may give us some more details of what to expect. Before we get into them, take a healthy spoiler warning in case you'd rather discover what's waiting in the raid on your own. Let's start with what we officially know: Dark Hours will be the first eight-player raid in The Division history. 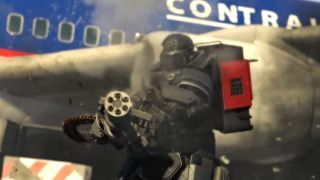 The snippets that Ubisoft showed in the trailer above reveal it will take place at least partially in the terminals and on the tarmac of an airport, and that it will feature the Black Tusk faction as antagonists. Ubisoft didn't give a specific arrival date for Dark Hours, saying only that it will come to the game after the arrival of the new Tidal Basin stronghold. That hasn't been added yet either, by the way, but the game did just come out last week. According to Reddit user kevindavid40, the airport in question is Ronald Reagan Washington National Airport (which makes sense since it's right across the river from DC), and you access the raid from the Arlington Memorial Bridge in the southwest part of the map. One of the datamined trophies for the raid is "Relentless: Make it through the bridge in one hour or less", so it sounds like that part could be a real meat grinder. Here's an image from kevindavid40 showing the location, featuring a faint cameo appearance from their software update notification. This datamined material could be inaccurate for a number of reasons: it may reflect an older version of the raid, or it could even be totally fabricated. That's the trouble with relying on leaks from the community rather than official announcements. It does line up with what Ubisoft's officially revealed so far, so I'm giving it the benefit of the doubt for now.